Lift-on/lift-off or "lo/lo" operations use cranes, roll-on/roll-off or "ro/ro" operations use ramps and float-on/float-off or "flo/flo" operations are the trademark of unique submersible hull ships that transport yachts. Specialized Heavy Lift Ships, also known as Float-on/Float-off (FLO/FLO) or semisubmersible ships, provide the capability to load, transport and offload outsized military cargo independent of port equipment traditionally used for handling large or extremely heavy cargo, such as tug boats, barges, landing craft, floating cranes, and single anchor leg mooring systems. Lifts range from approximately 50 to as much as 45,000 tons. These ships are designed to take on ballast water in floodable tanks that partially submerges the vessel. Cargo is then floated over the submerged portion of the vessel which then deballasts and surfaces under the cargo. After the vessel is full afloat, the cargo is secured for transport. So-called float in and float off ships are also known in which the floating cargo is floated into the ship's cargo space in superposed tiers in order to avoid the disadvantages of the use of ship borne lifting devices. A disadvantage of this arrangement is however that the ship must be lowered for each tier to an immersion of the ship which allows the floating vessels to be stowed into a stowage level vertically fixed within the ship. In addition they must be adjusted to fix deck or girder structures which segregate the cargo containers at various cargo levels. With such ships the height of the stowage spaces for each tier of floating cargo or floating containers has to be increased beyond and above the height of the floating vessels by an amount which results from the height differential between the light and deep load line of the floating vessels from the upper and lower safety margin in order to allow an undisturbed and accident free float in an float off of the vessels and from the requisite height to accommodate the structures of the ship which segregate the cargo levels. This results in the creation of a dead space in each cargo level above each settled tier of floating vessels and this requires that the depth of the transport ship be increased by this height differential for each tier of the floating vessels. The increased depth of the ship results in an increased ship's weight. This also requires that the ship's beam to be increased in order to maintain sufficient stability against capsizing of the ship. The increased beam again results in further increased ship's weight and all of this additional weight requires additional propulsive power. Therefore, the known ships of this type become more expensive in construction as well as in operation. The water depth requisite to accommodate such a ship when docking or releasing the floating vessels increases with the ship's depth. Thus, this limits the employment possibilities or prohibits the employment of such a ship precisely where the cargo loading and discharging has to be carried out that is in the coastal waters and as a rule restricts the use of the ships in respect to the depth of such waters. All military equipment has been affected to some degree by advances in technology, and some items have been changed radically. Modern Navy innovations include the semi-submersible heavy-lift ship, used to move smaller vessels over great distances of open ocean. The first was leased from Norway. The term "heavy lift ship" is ambiguous. By one definition, a heavy-lift ship is a ship that is specially designed and capable of loading and unloading heavy and bulky items. It typically has booms of sufficient capacity to accommodate a single lift of over 100 tons. This might be better known as a crane ship. By another definition, a heavy lift ship is an ocean-going vessel capable of submerging its large open deck to well below the water's surface, thus allowing another vessel to be floated over it and landed on a dry-dock-build mounted on the heavy lift ship's deck. The heavy lift ship then rises out of the water by pumping out its ballast tanks in a process very similar to the operation of a floating dry-dock. The transported vessel then rides on the deck of the heavy lift ship for the voyage to its destination. The Marlin class is capable of carrying semi-submersible rigs of up to 30,000 metric tonnes. Their large, free and open deck area makes the ships very suitable for skidding or rolling large cargoes onboard, and the ballasting system is especially designed for such operations. In keeping with conventional practice, floating cargoes are loaded by the float-on method. This is done by partly submerging the ship, until only the forward deck and stability towers aft remain above the surface. The cargo is then floated over the cargo deck, which is now deep (up to 10m) under water. When the cargo is in the correct position for loading, the heavy lift ships pump out water and de-ballast, leaving the cargo on deck. Non-floating cargoes can be loaded directly from a quay onto the deck of the ship by skidding or sliding the cargo over the quayside and onto the deck. Since the two stability towers on the Black Marlin and Blue Marlin can be removed, this can be done over the side of the ship or over the stern. Black Marlin and Blue Marlin have six sets of six ballast tanks, of which three sets are arranged longitudinally, divided by two longitudinal bulkheads. Uniquely, for ships of this size, the Black Marlin and Blue Marlin also have ballast tanks in the double bottom and double deck tanks, thus providing still more flexibility for difficult cargoes - large or small - and the ability to tune GMt to any desired level. In 2000, the USS Cole was transported in this way to Mississippi from Yemen aboard M/V Blue Marlin, a heavy lift transport vessel owned and operated by the Dutch firm, Dock wise Shipping BV. Similar operations were done in 1988 to transport Samuel B. Roberts (FFG 58) to the United States following mine damage; and in 1991 and 1992, during Operations Desert Shield and Desert Storm. The Roberts was transported to the United States on the Dutch-flag heavy-lift ship, Mighty Servant 2. Because Iraq was laying mines in the northern Persian Gulf, MSC contracted the heavy-lift ship Super Servant III, to transport three Navy minesweepers plus the newly-commissioned mine countermeasures ship, USS Avenger (MCM 1), to the Gulf. Heavy lift transport vessels were used to transport minesweeping vessels to and from the Persian Gulf in 2000, to move forward-deployed MHCs [coastal mine hunters] and MCMs [mine countermeasure] from Ingleside, Texas, to Bahrain; and in 2003, to move US Army watercraft to Kuwait. MV Blue Marlin is one of the world's largest heavy lift ships. She is used in the commercial sector to lift unwieldy cargo such as oil rigs. In July 2000, she performed her first service for the US Navy's Military Sealift Command -- transporting two Navy mine hunters from Corpus Christi, Texas, to Bahrain in the Persian Gulf. She was particularly attractive for the lift of USS Cole since Blue Marlin was already in the Middle East at the time of the attack. Commander, Fleet Forces Command (FLTFORCOM) and Commander, Naval Sea Systems Command (NAVSEA), Supervisor of Salvage and Diving (SUPSALV), stood-up a new Naval Reserve unit 01 November 2004 to support the heavy lift and transport of U.S. Navy ships and craft. This NAVSEA Heavy Lift and Dry-docking Unit is a direct result of revised salvage mission requirements developed after the attack and subsequent heavy lift transport of USS Cole (DDG 67). The unit will be ready to deploy worldwide on short notice, should the need arise to transport a damaged vessel to a friendly port for repair or to move smaller vessels and craft to regions where they are needed. Additionally, the unit will support both the inspection of foreign dockyards being considered for emergency repair work and emergency overseas dockings of US Navy vessels. The Heavy Lift Unit was established to meet the current and future needs of the fleet. Docking a ship that has sustained severe damage is an extremely critical event. This team will provide the emergency response necessary in today's threat environment and the expertise to ensure it is done safely and efficiently. 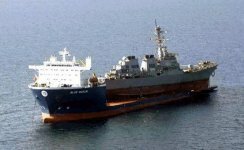 The old explanation that you can put a boat on a ship, but not a ship on a boat didn't apply to Military Sealift Command's (MSC) heavy-lift operation in Ingleside, Texas. USS Raven (MHC 61) and USS Cardinal (MHC 60), two coastal mine hunters from Mine Countermeasures Squadron 3 at NAVSTA Ingleside, were high and dry aboard the MSC chartered ship M/V Blue Marlin en route to the Persian Gulf. MSC chartered the heavy-lift ship Blue Marlin to carry the mine hunters Raven and Cardinal to their new duty station in Bahrain. Why load ships aboard a ship? Mine hunters Raven and Cardinal have specially constructed hulls and engines that are not built for the rigors of transoceanic travel. During the transit from Texas to the Persian Gulf, the engines would incur such wear and tear as to require drydocking and repairs upon arrival in Bahrain. Besides protecting the mine hunters, carrying them aboard a heavy lift ship saves a significant amount of time. It would take about 60 days for the mine hunters to travel to the Persian Gulf on their own power, whereas it takes about 40 days to travel aboard Blue Marlin. To secure Cardinal and Raven for the journey, wooden keel blocks were cut and affixed to the deck of Blue Marlin for the ships to rest on much like they would in dry dock. Blue Marlin then ballasted overnight in a deep channel sinkhole, flooding ballast tanks beneath its deck in order to partially submerge like a submarine. By the next morning, Blue Marlin's deck had sunk low enough for the mine hunters to be floated above the keel blocks. Harbor tugs then positioned Raven and Cardinal over the keel blocks with the help of a diver and lines attached to Blue Marlin's fore and aft towers. In the afternoon, Blue Marlin de-ballasted, raising the mine hunters out of the water and securing them on deck. The three-day loading operation took place at Aker-Gulf Marine 21-23 July 2000, and was filmed for a Discovery Channel program scheduled to air in February 2001. Blue Marlin departed Texas 24 July 2000 for its month-long transit to Bahrain. 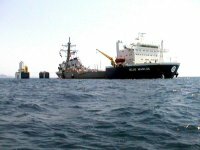 After the terrorist attack on the USS Cole in Aden, Yemen on 12 October 2000, the Navy let a contract with a Norwegian firm that owns the Blue Marlin. The 505-foot USS Cole survived a terrorist attack that left a 40-by-40-foot hole in her port side and 17 US Sailor casualties. Navy designers worked with the ship's company to develop blocks and sea fastenings to be placed upon Blue Marlin's deck. A shipyard built these on Blue Marlin's deck in Dubai. Blue Marlin then sailed to the Gulf of Aden and USS Cole. The heavy lift ship hauled the Cole aboard and carry her piggyback to its home port of Norfolk. The transport is six days away in the United Arab Emirate of Dubai. Loading the Cole took eight days, and the voyage home took another 25. The Cole crew flew home once their ship was aboard the Blue Marlin. To lift the destroyer, Blue Marlin filled her ballast tanks, slowly submerging her deck until only the house and two aft towers are visible above the waterline. Tug boats then helped position Cole above Blue Marlin's submerged deck. Once Cole was positioned, Blue Marlin slowly emptied her ballast tanks and her deck slowly rose to meet the destroyer. Once the destroyer was resting on the blocks on Blue Marlin's deck, the heavy lift ship continued to de-ballast until she was at her normal draft of about 35 feet. The entire operation took about 24 hours, after which workers finished securing Cole aboard Blue Marlin to prepare for the ships' transit to the United States where Cole underwent repairs. The 1945-vintage cargo ship Marine Fiddler was built as a cargo ship and converted later to a heavy-lift ship. It carried a number of unusual cargoes, including a $15-million art collection from Europe to the U.S., a nuclear reactor to Greenland, and more than 6,000 refugees to safety from North Vietnam. As an offshoot of technology being developed under the US Department of Energy (DOE) Clean Coal Technology Demonstration Program, in 2000 the DOE Office of Fossil Energy began exploring conceptual designs for barge-mounted power systems that have significant commercialization potential in developing countries. Work is under way by DOE and a Cooperative Research and Development Agreement (CRADA) partner, RimStar America, of California. As designed, units would have a range of outputs from 40-300 MWe and fit on a marine barge that is transportable by a heavy lift ship. The power barges use coal-fired pressurized fluidized-bed combustion (PFBC) technology, which has been under joint development by DOE and Foster Wheeler. To enhance overall economics, the barges would use an arrangement of industrial turbomachinery specially configured for use with coal-fired PFBC systems, instead of attempting to adapt gas turbines that originally were designed to burn either gas or oil. Barge-mounted power plants using gas turbines and diesel engines have already been built, and many such units are in operation today. Coal-fired PFBC power units would be a new breed, but would fit into a relatively small footprint, making barge mounting feasible for this clean, coal-fired technology. The developing world has a growing need for sources of environmentally clean, economical power generation. Oil and gas prices have risen to the point where coal-fired generation provides strong operating cost savings. Movable systems would allow developing countries to test PFBC for a short period of time on local coals, and would give investors the flexibility to move the barge as required to protect their asset. The compact size of the PFBC unit allows its placement on a barge that is transportable to any coastal site in the world. Finally, barge mounting enables the units to be manufactured in a U.S. naval shipyard. Financial incentives are available in the form of U.S. Maritime Administration loan guarantees for a major portion of the debt incurred in financing of the units. The barge-mounted designs are based on the use of Dresser-Rand Corporation (D-R) industrial turbomachine components. These units have been designed to fire Philippine Liguan bituminous coal. The two large units are mounted on a barge with dimensions of 108 feet across the beam by 570 feet from stem to stern; two smaller units fit on barges that are 108 feet by 370 feet. The 140-MWe PFBC power barge is mounted on a heavy lift semi-submersible transport ship, in position to move to virtually any coastal location in the world. The US Navy recovered to the maximum extent practicable Ehime Maru crewmembers, personal effects, and certain characteristic components unique to Ehime Maru, by moving the vessel to a shallow-water area to permit safe diver access and recovery operations. The Navy used a specially-equipped offshore construction vessel -- Rockwater 2 -- to lift and move Ehime Maru from its initial location. The Navy considered removing Ehime Maru from the water by placing its hull on a submersible barge or heavy lift ship such as M/V Blue Marlin. However, the maximum depth at which these vessels can ballast down is approximately 30 feet (10 meters). Because the keel of Ehime Maru when suspended would be approximately 115 feet (35 meters) below the surface, use of a submersible barge or heavy lift ship was not possible. The option of heavy lifting Ehime Maru to the surface by way of a spreader assembly while still rigged was analyzed. Under this scenario, the vessel would be lifted, positioned on a barge, taken to Pearl Harbor, and off-loaded on land for crewmember recovery. This option had severe structural and stability issues, especially when breaking the sea/air interface. This option would also increase environmental hazards caused by any residual oil release beyond an acceptable risk. Blue Marlin has been converted into the world's largest heavy transport carrier to meet future transportation needs of ultra large and heavy cargoes. The 63-metre-wide unobstructed cargo deck provides a safe platform for a wide variety of cargoes. Loading and discharging options include float-on/float-off, roll-on/roll-off, skid-on/skid-off, lift-on/lift-off or any combination of these methods. The conversion of the Blue Marlin was completed at the break of 2004. More and more owners of sail and motor yachts desire a safe passage of their yacht over the Atlantic Ocean. This prompted a concept of the yacht carrier as the safest and fastest way to transport the valuable yachts. The yacht carrier is designed for transit speeds enabling the crossing from the Mediterranean Sea to the Caribbean in days. An interesting feature of this ship is the unique float-in-float-out loading method facilitated by extensive ballasting system. The ships are provided with additional accommodations for crews of the yachts that sail along.